On November 12, the 2015 Democrats Abroad Global Auction is going live, with a lot of great items available for bidding. 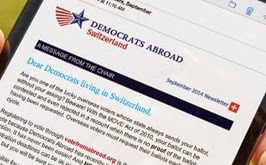 Our online auction will raise much-needed funds in Switzerland and around the world, to help US citizens living overseas elect Democrats in 2016. But … with just a little more than 3 weeks to go, we’d really like more items in the bidding pool. Go to www.BiddingForGood.com/Demsabroad and check for yourself the many interesting items already donated, including vacation rentals, services, works of art, literature and collectables. If you register, you will be one step closer to being able to bid when we go live on Nov 12th. Switzerland members have already donated week-long vacation rentals, a classical music library, surrealist artwork and political memorabilia. Now, decide what you might donate, to support DA Switzerland. This week is the time to do it. Valuable merchandise, collectibles, business or personal services, home stays or access to unique events are all welcome. Just click on the Donate Items link and add your donated items. Problems or questions? Email us at auction@democratsabroad.org. When your item sells, Switzerland and Democrats Abroad split the net proceeds, for the Get-Out-the-Vote activities of both. While you are there, why not add the page to your Facebook likes.... the more who know about it, the better the auction will be. You can even post a specific listing to your Facebook every few days, to spark interest. Pick out that item and donate it this week. Let’s make this auction a splendid success, and give Democrats Abroad the funds it needs to deliver a huge Democratic overseas-voter turnout in 2016!